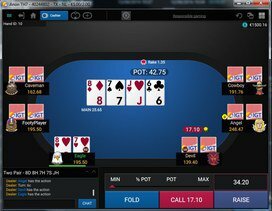 While it is possible to use bluffing technique successfully in a limited pot poker game, the strategy is most effective and exciting in no limit Texas Hold 'Em, where the stakes are often higher. Pulling off a bluff can be tricky, but it can have a big pay off. The key is knowing what kind of bluff to use and when to use it. There is not just one kind of bluff in poker. You can play passively while you hold a good hand, or you can do the reverse. You can pull off what is called a "bluff with air," in which case you continue to bet even if you are sure you have a losing hand. You can also try the "semi-bluff," wherein you bluff against your opponents in the hopes that down the river you can still draw a good hand (thus making your bluff a reality). While some players will advise you to mix up your strategy to keep players guessing, when it comes to bluffing, consistency is key. This doesn't mean that you should always bluff in the same specific scenario. Rather, it means that you should play the same way in most scenarios, regardless of your hand, so players can truly never tell you are bluffing. When deciding when to bluff, it is also important to consider your position at the poker table. As in most cases, the late positions have the advantage in terms of bluffing as well, since these seats have already been able to read their opponents' moves. Thus, if you are one of the last to act in a round, use the opportunity to bluff if necessary. The latest poker bonuses in your email!